The conversation about climate change largely revolves around greenhouse gases. Agriculture is both a source and sink for greenhouse gases (GHG). A source is a net contribution to the atmosphere, while a sink is a net withdrawal of greenhouse gases. In the United States, agriculture is a relatively small contributor, with approximately 8% of the total greenhouse gas emissions, as seen in Figure 1. 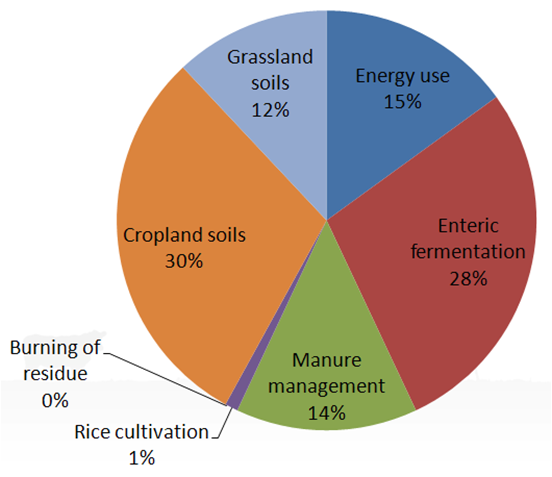 Most agricultural emissions originate from soil management, enteric fermentation (microbial action in the digestive system), energy use, and manure management (Figure 2). The primary greenhouse gases related to agriculture are (in descending order of magnitude) methane, nitrous oxide, and carbon dioxide. 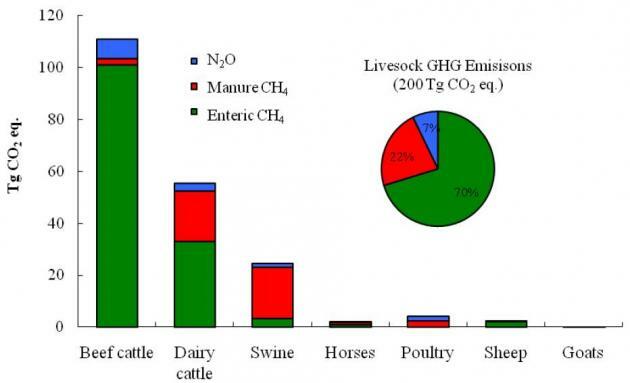 Within animal production, the largest emissions are from beef followed by dairy, and largely dominated by the methane produced in during cattle digestion (Figure 3). Excess nitrogen in agriculture systems can be converted to nitrous oxide through the nitrification-denitrification process. Nitrous oxide is a very potent greenhouse gas, with 310 times greater global warming potential than carbon dioxide. Nitrous oxide can be produced in soils following fertilizer application. This includes both commercial, inorganic fertilizer as well as organic fertilizers like manure or compost. The next largest portion of livestock greenhouse gas emissions is from methane produced during enteric fermentation in ruminants – a natural part of ruminant digestion where microbes in the first chamber of the stomach, the rumen, breaks down feed and produces methane as a by-product. The methane is released primarily through belching. There are many smaller sources of greenhouse gases on farms. Combustion engines exhaust carbon dioxide from fossil fuel (previously stored carbon) powered vehicles and equipment. Manufacturing of farm inputs, including fuel, electricity, machinery, fertilizer, pesticides, seeds, plastics, and building materials, also results in emissions. Definition: carbon footprint is the total greenhouse gas emissions for a given person, place, event or product. Carbon footprints are created using a process called life cycle assessment. Life cycle assessment or LCA is a method of resource accounting where quantitative measures of inputs, outputs and impacts of a product are determined. boundaries of the system: each higher tier provides a more complete picture of the product’s impacts, however requires more time and resources to complete. Cradle to Gate (Tier II) – inputs are taken back to the initial extraction as natural resources up to a certain point in the product’s life such as its sale from the farm, i.e. farm gate. This will include both direct and indirect emissions from the product. Cradle To Grave (Tier III) – the product is followed through the consumer to its eventual recycling or disposal. Recommended Reading – How Many Greenhouse Gases Does Agriculture Emit? EPA greenhouse gas inventory updated annually. Use the data explorer to highlight agricultural emissions. Are models useful in determining the footprint of pork production?